I just saw the new Star Wars with my family. 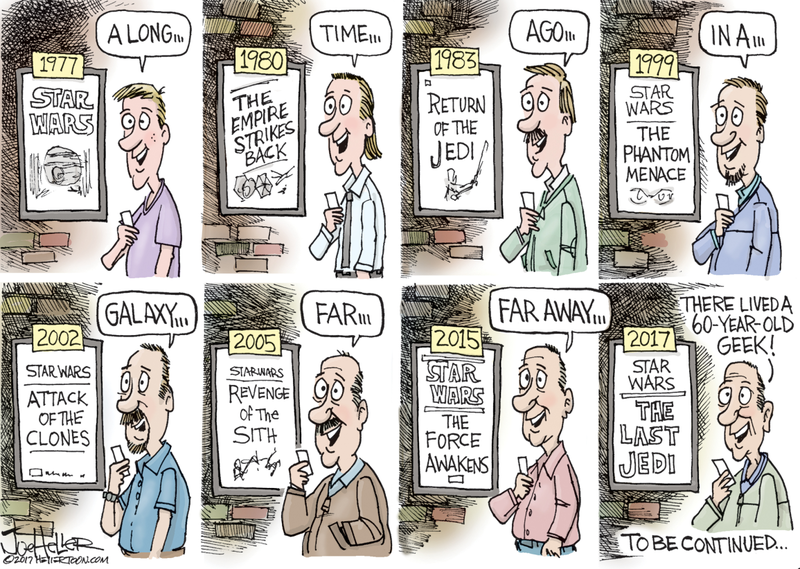 I can still remember watching the first one. BTW, I'm not 60 yet ... but, I am pushing double nickels. When it comes to American pastimes, many people focus on the big 3 sports: Football, Basketball, and Baseball. Nevertheless, there are a lot of different ways people spend their time. It is interesting to see what they watch - and what they actually play. Nevertheless, there are a lot of different ways people spend their time. It is interesting to see what they watch - and what they actually play. There is also a big difference based on income distribution. Here is an infographic. Apparently, rich people like golfing, yoga and racquet sports ... while poorer people disproportionately liked relaxing, writing for personal interest, and having hobbies. It is also kind of interesting to see when people tend to do certain activities. 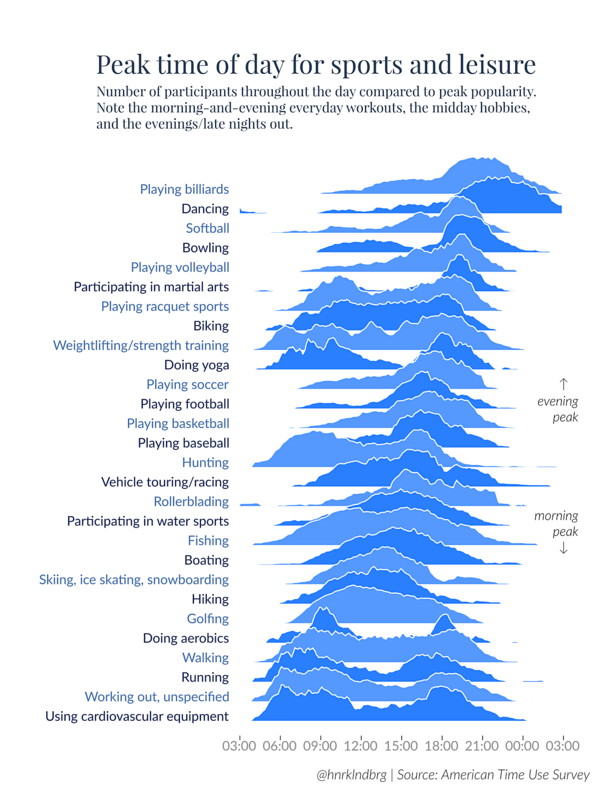 Here is a chart showing the peak time for various sports and activities. You could build a business around data like that. As a fund manager, I am always looking for ways to eliminate emotions (like fear and greed). But as a father whose son just got married, the equation was different. We’re officially two weeks away from the premiere of “Star Wars: The Force Awakens”. In keeping with the spirit, here is an infographic for Star War fans to navigate the galaxy of investments. Click it to see a bigger version. An infographic by the team at RCM Alternatives. Tense matters ... For example, 'Has' versus 'Had'. Here is a quote I've thought about several times. The guy who said that was Wayne Dyer. Unfortunately, he just passed away. To celebrate his life and work, his publisher made some of his content free to watch, including his film, "The Shif". In this film, Dyer explores the journey from ambition to meaning. The powerful departure from our obsession with self and status (and always wanting more) is shown in stark contrast to a life of meaning, focused on serving and giving back … and living with purpose. Dr. Wayne W. Dyer was an internationally renowned author, speaker, and pioneer in the field of self-development. Over the four decades of his career, he wrote more than 40 books (21 of which became New York Times best-sellers), created numerous audio programs and videos, and appeared on thousands of television and radio shows.